In a great diversity of lakes, ponds, slow to rapid streams, rivers, ditches, and pools. The status of our white-flowered aquatic buttercups in Ranunculus subg. Batrachium is a source of seemingly endless confusion and frustration. It seems excessive to lump our plants with the heterophyllous R. aquatilis, and we refer most of our plants to R. longirostris, but for a few specimens from northern Michigan which appear to be R. trichophyllus Chaix, at least as defined by short styles and achene beaks (see key). The vegetative features sometimes cited as distinguishing these two seem too variable. Many of our specimens, however, are unsuitable for critical determination, and these have all been mapped, for convenience, with R. longirostris. Additional ample fertile collections of this complex, ideally in fruit where the characters are best observed, are much needed. 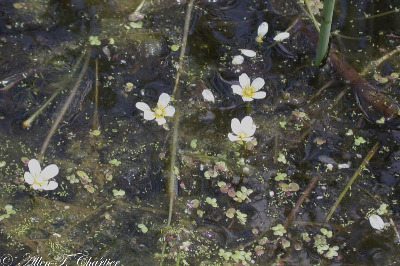 Vegetative aquatic buttercups with dissected leaves (this species plus R. flabellaris, R. gmelinii, and R. trichophyllus) may be distinguished from all other submersed aquatics with dissected cauline leaves by the combination of alternate leaf arrangement (unlike Myriophyllum, Ceratophyllum, and some others), absence of bladders (unlike Utricularia), and absence of a definite central axis in the leaves (unlike Rorippa aquatica, Proserpinaca, and Myriophyllum). The tips of the leaf segments in R. longirostris and R. trichophyllus bear tiny translucent spicules. MICHIGAN FLORA ONLINE. A. A. Reznicek, E. G. Voss, & B. S. Walters. February 2011. University of Michigan. Web. 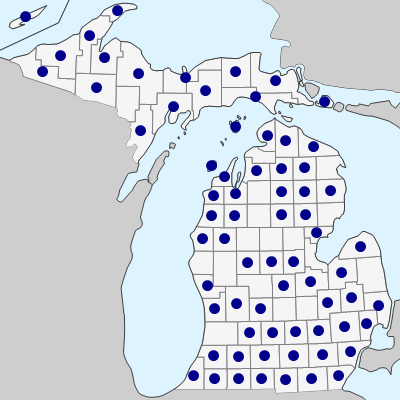 April 21, 2019. https://michiganflora.net/species.aspx?id=2384.